The information below is taken from the Dictionary of American Naval Aviation Squadrons, Volume 2, Chapter 3, Patrol Squadron Histories. https://www.history.navy.mil/content/dam/nhhc/research/histories/naval-aviation/dictionary-of-american-naval-aviation-squadrons-volume-2/pdfs/chap3-1.pdf This is the official history of the second VP2, a direct descendant of Bombing Squadron 130 (VB130) flying PV-1s. A link to an abbreviated narrative format history is at the bottom of this page. The first Navy aircraft squadron to carry the designation of Patrol Squadron TWO descended from Patrol Squadron TEN, established in 1924. https://www.history.navy.mil/content/dam/nhhc/research/histories/naval-aviation/dictionary-of-american-naval-aviation-squadrons-volume-2/pdfs/chap4-5.pdf I remember meeting a man at the 1986 reunion who had served in VP2 in the 1930's. As of Jun 2004, we have one member who served in VP2 flying PM-2s in 1934-36 out of Coco Solo, Panama. The history of the first VP2 is here. Established as Bombing Squadron ONE HUNDRED THIRTY (VB-130) on 1 March 1943. Redesignated Patrol Bombing Squadron ONE HUNDRED THIRTY (VPB-130) on 1 October 1944. Redesignated Patrol Squadron ONE HUNDRED THIRTY (VP-130) on 15 May 1946. Redesignated Medium Patrol Squadron (Landplane) TWO (VP-ML-2) on 15 November 1946. Redesignated Patrol Squadron TWO (VP-2) on 1 September 1948, the second squadron to be assigned the VP-2 designation. Disestablished on 30 September 1969. VB-130 was established at Deland, Fla., on 1 March 1943, but it was not until after the squadron had been redesignated VPB-130 that any record of a squadron insignia was found. 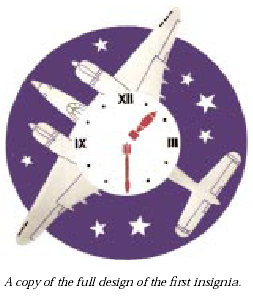 The first insignia, approved by CNO on 8 November 1945, superimposed a clock face with a bomb for the hour hand and rocket for the minute hand set at one thirty, on a silhouette of a PV-1 Ventura aircraft with a starlit sky as background. The design symbolized the round the clock bombing and rocket operations capability of the squadron’s first aircraft, the PV-1 Ventura. The field was royal blue; stars, white; aircraft, light gray with black markings; clock, white; numerals, black; and clock hands, red. VPB-130 was redesignated VP-130, then VPML- 2, and transitioned from the PV-2 Harpoon to the P2V Neptune patrol bomber. In keeping with the redesignations, transition to a new aircraft, and reassignment of basic mission to antisubmarine warfare, a new squadron insignia was deemed appropriate. The new design, approved by CNO on 10 June 1947, presented a cartoon King Neptune riding a rocket, against a starry sky and globe background. In Neptune’s hand was a trident with cannon barrels in place of tines. The background of the globe represented the long-range capability of the P2V Neptune. The night sky denoted around-the-clock flying and King Neptune symbolized the sea and squadron’s aircraft. The rocket was incorporated into the insignia to show the fast punch of Neptune’s armament. The trident with multiple gun barrels denoted the aircraft’s multiple firepower. Colors: stars, white; sky, dark blue; water, light blue; continents, white; rocket, light gray; King Neptune’s belt, blue; pants, red; beard, white; crown and trident, yellow; nose, red; body, pink; and guns, gray. 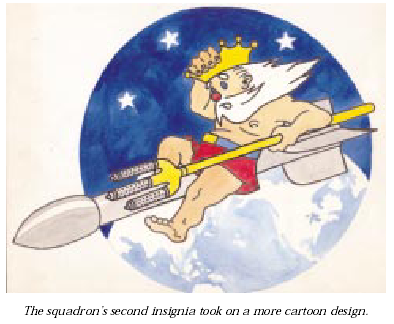 The cartoon King Neptune insignia was adopted by the squadron after its redesignation from VP-ML-2 to VP-2, and remained in use until 1 October 1956. At that time, CNO directed the squadron to come up with a new design “. . . in keeping with the dignity of the naval service, [as] cartoon portrayals are not authorized in Naval Aviation Insignia . . . ” The resulting modification of the squadron insignia portrayed a less stylized King Neptune inside a blue disk with white border, Neptune white-haired and bearded, crowned yellow, and clothed in flowing red toga. The right arm extended forward, the left hand grasping a yellow trident, Neptune was astride a black torpedo, colored white, above the top portion of a blue globe were longitude and latitude lines outlined in white. In an arc at the top of the shield there were three white stars, two above the extended arm and one behind the figure. The inscription PATROL SQUADRON TWO was on a blue scroll in white capital letters. This design was approved by CNO on 28 February 1957 and remained in effect until the squadron’s disestablishment in 1969. 3 Mar 1943: VB-130 was established at Deland, Fla. Organization and training of squadron personnel took place over the next two and a half months, followed on 17 May 1943 by shake-down training flying the PV-1 Ventura at Boca Chica, Fla.
7 Jun 1943: The squadron deployed to San Juan, P.R., to provide convoy protection and ASW in Caribbean waters. On 16 June 1943, the squadron was relocated to Edinburgh Field, Trinidad, to continue convoy protection and antisubmarine atrols. 6 Aug 1943: Lieutenant Holmes and his crew sank the German submarine, U-615, commanded by Kaptainleutnant Ralph Kapitzky. The submarine was caught on the surface in the Caribbean southeast of Curacao and damaged badly enough by the bombs to prevent it from submerging. Unable to escape, the German crew scuttled the vessel. Forty-five of the Uboat’s crew of 49 were rescued by U.S. Navy vessels. 12–27 Aug 1943: The squadron moved to Recife, Brazil, where it remained until 27 August 1943, when it was shifted again to Pici Field, Fortaleza. Antisubmarine patrols and convoy coverage were the primary activities of the squadron during the next eight months. 30 April 1944: VB-130 was relieved by VB-134 and returned to NAS Norfolk, Va. for home leave. 3 Jun 1944: The squadron was reequipped with rocket launchers. Ground attack training using rockets took place over the next 30 days. 3 Jul 1944: VB-130 began ferry operations to shift equipment, personnel and aircraft from NAS Norfolk, Va., to NAS Alameda, Calif. On 6 August 1944 the squadron boarded Shirley Bay (CVE 85) for transfer to NAS Kaneohe, Hawaii, arriving on 13 August 1944. 10 Oct 1944: VPB-130 transferred to Ponam on Manus Island. Training continued along with operational ASW and antishipping patrols. 1 Nov 1944: VPB-130 began transferring its assets and personnel to Tacloban in the Philippine Islands, via Owi Island, Peleliu, Palau and Morotai. Squadron aircraft arrived on 6 November 1944, and were placed under the tactical control of the 308th Bomb Wing of the Army 5th Air Force. Through April 1945, the squadron undertook a variety of missions in conjunction with 13th Army Air Force operations. Detachments operating from Morotai and Owi Island conducted 300 to 600-mile sector searches. The remainder of the squadron at Tacloban conducted 1,000-mile sector searches. Numerous attacks were made on Japanese island installations, radar sites, airfields and small ships. 24 Apr 1945: VPB-130 transferred to Manus Island, where all personnel boarded Kadashan Bay (CVE 76) on 1 May 1945 for return to the continental United States, where home leave was given to all hands. 31 Aug 1945: VPB-130 was reformed at Ault Field, NAS Whidbey Island, Wash., and training of personnel commenced utilizing new aircraft, the PV-2 Harpoon. 29 Sep 1946: The “Truculent Turtle,” the squadron’s first P2V-1 Neptune land-based patrol bomber, flew from Perth, Australia, to Columbus, Ohio, a distance of 11,236 miles in 55 hours and 18 minutes. The aircraft (bureau number 89082) was manned by Commanders Thomas D. Davies, Eugene P. Rankin, Walter S. Reid and Lieutenant Commander Roy H. Tabeling. The flight was nonstop, without refueling, establishing a world record for nonstop flight. When the aircraft was taken out of service years later, it was placed on display at NAS Norfolk, Va. This historic aircraft is now on display at the National Museum of Naval Aviation, Pensacola, Fla.
March 1947: VP-ML-2 began receiving the rest of its compliment of P2V-1 Neptunes from Lockheed Aircraft Company, Burbank, Calif. These replacements for the PV-2 Harpoons marked the beginning of an intense period of training for all squadron personnel in antisubmarine warfare. 5 Jun 1950: VP-2 was assigned a tour in Alaska for cold-weather operational training. The squadron provided resupply missions for the Oceanographic Survey being conducted in Alaskan waters. 1 Aug 1951: A detachment of VP-2 flying P2V-3Ws deployed to NAF Naha, Okinawa, to patrol the East China Sea and Yellow Sea in the Korean theater of operations. The detachment remained in the combat zone until December 1951, this was squadron’s first and last involvement in the Korean War. 1 Sep 1951: VP-2 became the first squadron to receive the new P2V-4 with the Wright Aero R-3350W compound-turbo engine. Testing of the new engines was performed onsite at NAS Whidbey Island, Wash., without missing deployments. Detachments during this period were assigned to NAS Kodiak, Alaska, and Naha, Okinawa. The Naha Detachment remained until 2 December 1951, flying several combat missions in support of the UN action in Korea. 9 Apr 1954: A Neptune from VP-2 was attacked by a Chinese MiG-15 while on patrol over the Yellow Sea. The MiG made three firing passes and the crew of the Neptune returned fire. There was no apparent damage to either aircraft resulting from the encounter. 30 Nov 1964: VP-2 took first place among the Pacific Fleet squadrons in bombing, mining and rocket competition despite instrument flying conditions during 90 percent of the competition period. 25 Jan 1965: VP-2 relieved VP-6 for a six-month deployment at Iwakuni, Japan. Squadron detachments were assigned to Naha, Okinawa; Sangley Point, R.P. ; Taiwan, Formosa; Bangkok, Thailand; and Da Nang and Saigon, RVN. The last three months of the squadron’s WestPac tour was conducted at Tan Son Nhut Air Base, Saigon, RVN—the squadron’s first tour in a combat zone since World War II. 1 Apr 1966: VP-2 relieved VP-42 for a six-month WestPac deployment at Iwakuni, Japan. Four months of the tour were spent at Tan Son Nhut Air Base, Saigon, RVN. 1 Oct 1967: VP-2 deployed to WestPac with half of the squadron at NS Sangley Point, R.P., and a six-aircraft detachment at Tan Son Nhut Air Base, Saigon, RVN. The detachment at Ton Son Nhut moved a few weeks later to Cam Rahn Bay, RVN. 17 Feb 1969: The squadron conducted its last deployment, its fourth to the Vietnam theater of operations, based at NS Sangley Point, R.P. 30 Sep 1969: VP-2 was disestablished at NAS Whidbey Island, Oak Harbor, Wash.
* The squadron remained deployed overseas, but moved to a new operating base during the deployment. ** The squadron conducted split deployment to two sites during the same dates. * The squadron remained part of FAW-4 but was assigned thetail code SB on 7 November 1946. ** The squadron’s tail code was changed from SB to YC in 1957. The effective date for this changewas most likely the beginning of FY 1958 (1 July 1957). Listing of those who perished.